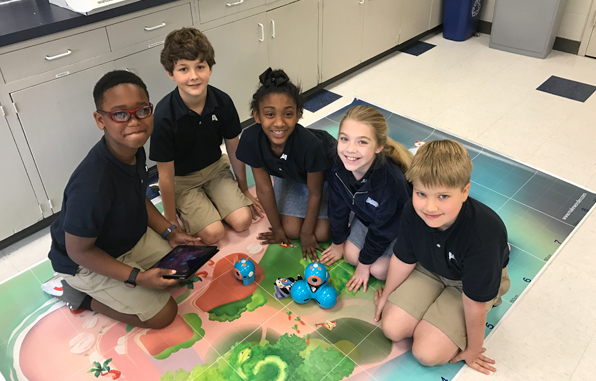 Robotics teams in Jackson Academy’s fourth grade earned first place in the state in a global competition for lower school students. The four JA teams that completed the coding challenge each earned a perfect score. They all tied for first place in the state of Mississippi. Globally, the JA teams were among only 180 of 5,200 teams that received a perfect score. The teams took part of a challenge called Animal Habitat Rescue, and using robot Dash, along with his sidekick, Dot, they completed five animal-saving challenges before a December deadline. The competition is one aspect of a systematic coding curriculum that has been added to the Lower School STEM program for grades first through fourth at JA. Using various age-appropriate robots and apps, the students learn programming, predicting, and problem-solving skills. Earning first place for Mississippi were Team JA Dash (Anderson Ueltschey, Addison Jeffcoat, Willis Thigpen, Foster Meacham); Team Dynamite (Aniyah Brown, Anna Catherine Bennett, Law Stanley, Mason Brantley); Team Flaming Unicorns (Faith Wicks, Brooke Singleton, Ian Hosch, Parker Puckett); and Team Rainbow Parrots (Brooke Emerson Ogden, Lynnzee Stapleton, Micah Wallace, Parker Halford, and Aaron Howard).